Hello folks. After some work every now and then I'm finally happy to present the feature complete Median XL skill calculator! An app that allows you to work out the damage of all spells and attacks in the game based on your character's unique combination of stats and skills, as well as track the progression of every passive ability, buff and debuff. If you have ever wondered how much damage a certain proc does, how an oSkill will scale into the endgame (and any surprising hidden synergies it might have) or exactly how much benefit you will gain from an equipment upgrade then this is the tool for you. It is first and foremost a tool. As with any tool, its usefulness will depend on the skill of the user. A damage simulator. It cannot tell you how many fireballs are in your Cataclysm cast, or how many targets your Stormcall will hit in a single cast in uberlevel X or how many times can you cast the chosen spell in 1 second. 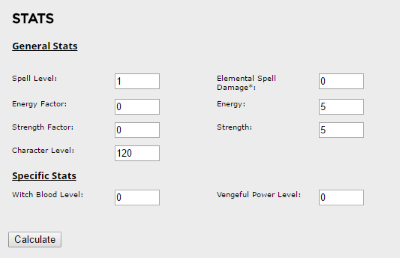 It's a tool that emulates the numbers you see on your character sheet in game and helps you theorycraft your build. The calculator has three sections. Select a skill. Input your stats. Then press calculate. Once fully loaded, it will work offline too. Requires a non-ancient browser. General Stats: most of these are self explanatory. Strength affects spell damage only if you have the strength factor stat. Character level - it might be a surprise to some, but yes it does indeed affect the damage. Elemental spell damage - this includes fire/cold/lightning and poison spell damage. The reason that physical/magic damage is separate is due to the way it works behind the scenes (it's a dummy stat). Specific Stats: these fields are automatically generated if the spell you have selected is affected by any unique stats. Phys/Mag spell damage - is included here. X Level - means the final skill level of ability X (soft & hard points). X Base Level - hard skill points invested into skill X. The grid displays the class spells first and then the oSkills. You can filter the spell list by name (case insensitive). Left click on a spell icon to select the one you want to run numbers on. This information appears in the Results section once you have clicked calculate. On the first row you have the name, minimum and maximum damage range, the damage source and an average. The second row tells you how much damage you will gain from an extra spell level and the percentage change. It also tells you how much a single spell level is worth in terms of spell damage. This way you can compare and evaluate gear options much more efficiently. Poison damage is listed with per second damage values, to allow for easier comparisons. WDM = Weapon Damage Multiplier. Your total weapon damage of all elements is multiplied by this number and then passed to the skill. The "damage to attack" part is bonus "offhand" damage granted by the skill itself and is NOT affected by the above multiplier. For example lvl 18 Bladestorm, on a lvl 120 character adds 936 magic damage to every sword and not 312. Another example: lvl 18 Thundergod adds 1200 average lightning damage. This damage is passed unchanged to the novas the skill generates. However your stormblast only receives 50% of the value so 600. Since this is the first release version there will be bugs. If you find that the calculator gives a drastically different result compared to what you see in game do report it in this thread. Same goes for any skill that you want to see included as I might have missed some when compiling the list. Any other feature requests? Let me know. Twin fang class icon contains the fire nova only. The oskill version the poison nova only. Werewolf form doesn't know if it's supermaxed or not (bonuses only apply if it is supermaxed) - too lazy to fix. Big thanks to Marco for MXLDB and for helping me with the project. Great work! This will be very helpful for planning out characters. I think it's great it includes oskills and procs as well. Now I'll be able to find out how much fire splash does and whether it is worth it as a proc. Just wondering if it could also passives and buffs like plague, nephlem weapons, curare, etc although those are not spells so maybe that's why you didn't include them. 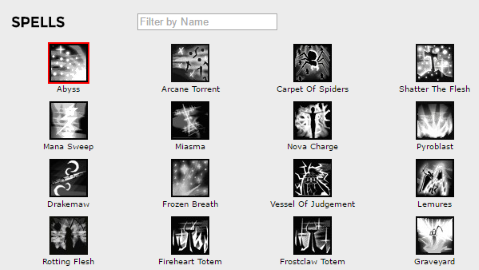 Also, fire cannonade and winter avatar seem to be repeated. ps: hmm seems like the damage on lvl32 tempest on sky spirit seems pretty tame? but then (i'm guessing) it multihits, so the damage is higher than that shown on screen. I don't mean to dwell...but I can't help myself. qweqwe wrote: Just wondering if it could also passives and buffs like plague, nephlem weapons, curare, etc although those are not spells so maybe that's why you didn't include them. Yes they are not spells, but they are quite straightforward to factor into the existing structure so I might add them eventually. qweqwe wrote: Also, fire cannonade and winter avatar seem to be repeated. qweqwe wrote: ps: hmm seems like the damage on lvl32 tempest on sky spirit seems pretty tame? but then (i'm guessing) it multihits, so the damage is higher than that shown on screen. Yep, it has no next delay, the bolts pierce and overlap their aoe. Hasn't you already been married to whist, Marco?